Ram SRT10 and Ram SRT10 Quad Cab™ have new hydroformed, fully boxed frame and new interior and exterior designs, combining the ultimate in performance with extraordinary convenience and utility. The legendary Viper engine is the focal point of the drivetrain: an 8.3-liter V10engine, unleashing 500 horsepower and 525 lb.-ft. of torque. Transferring that power to the pavement begins with a Hurst shifter, fitted to a T-56 six-speed manual transmission. The SRT formula is injected into the Ram SRT10 Quad Cab: Viper V10 engine, performance suspension, awesome brakes, race-inspired interior and bold styling. 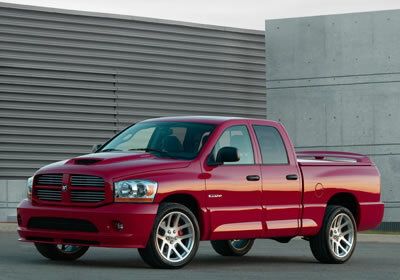 In addition to second-row seats, there are other important distinctions between the Ram SRT10 Quad Cab and Ram SRT10 regular cab. One distinction is an automatic transmission—a super-duty four-speed that is specially tweaked to provide optimum performance with the capability of towing 8,150 pounds.